Steady progress in computing power has motivated computational materials scientists to try new approaches to modeling materials. 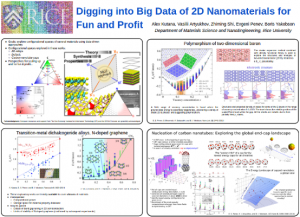 Here we explore data-driven and data-centric approaches to explain the properties and behavior of real advanced materials or accelerate the discovery of new ones. Often, this necessitates the sampling of enormous configurational spaces due to chemical and/or structural variety and processing the associated `big-data’ computational output. Selected examples are presented illustrating a state-of-the-art approach that allows for an elegant use of statistical mechanics methods (“cluster expansion”) in combination with first-principles density-functional theory (DFT) calculations, leading to a thorough exploration of the configurational space. Materials systems include the alloys of two-dimensional transition-metal dichalcogenides M1-xM’xX2yX’2(1-y), the 2D materials family within the B-N-C phase diagram, the peculiar, no longer hypothetical, 2D polymorphs of elemental boron, as well the end-caps of single walled carbon nanotubes.